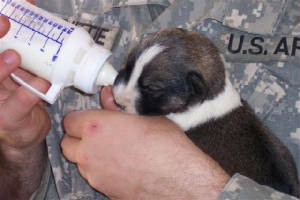 "IED" get his first bottle. 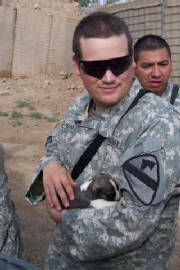 "IED" a little puppy that the platoon adopted lived with them at the Iraqi Army compund for awhile last fall. 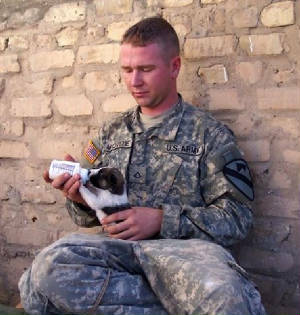 He was very young when they first found him so they fed him with a bottle. 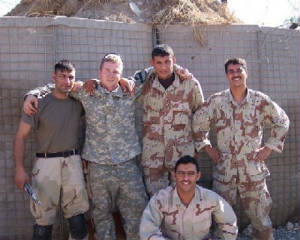 Unfortunately, IED is no longer with them. During the short time that he was, he quickly found a place in their hearts. 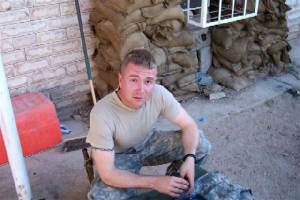 Nike (SPC McClellan) and IED. 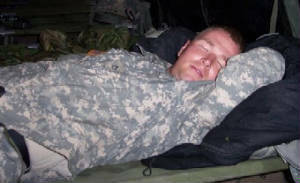 SGT Corona is in the background. Finger lickin' good. Brad, "support dude", & Nick. 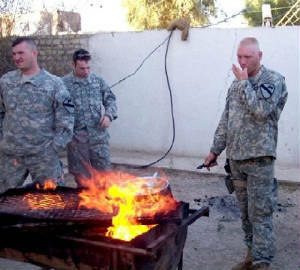 Grandpa (SGT Nick Wharton) expertly mans the BBQ. Nathan and Griff on the rooftop after a hard day. Nathan and some school kids. 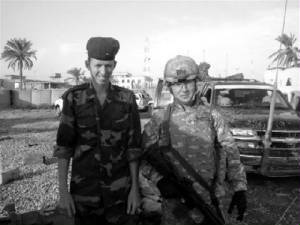 Nathan with Iraqi Army soldiers. 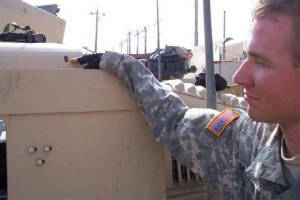 SPC Nathan MacVittie with "IED". 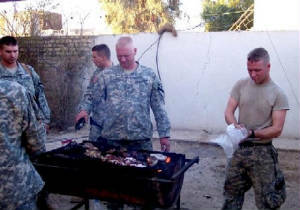 The guys like to BBQ when they are at the Iraqi Army compound. The go to the market and buy meat (lamb or beef). The try to get it early when it hasn't been hanging out in the open too long. As you can see those are pretty good sized chunks of meat. 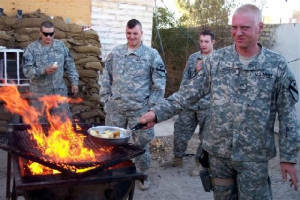 SGT Wharton knows how to fry potatoes too! More pictures of the BBQ are posted on the February Page. Nike and Griff watch as Grandpa fries potatoes. 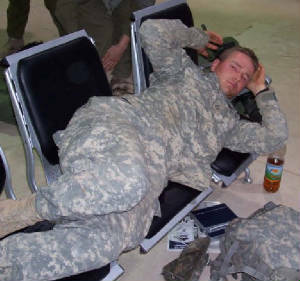 The friendly neighborhood "support dude", in back. 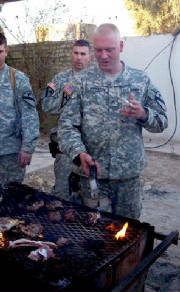 SSG Daniel Morris holds the salt. 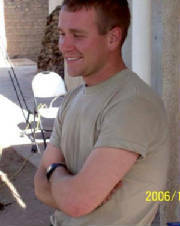 Nick cooks. Nathan hold a ice bag...did he burn his hand? 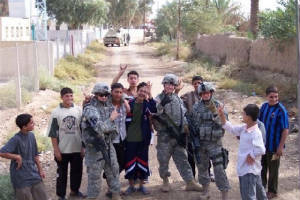 The guys went to this town to help an Iraqi Police department repair some of their vehicles. 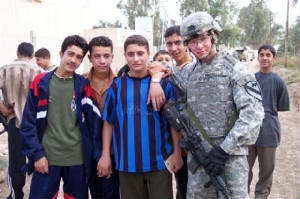 There was a school close by so while the "mechanic" helped with the repairs some of the other soldiers visited with curious school kids who had gathered around. The kids speak good English. With the school kids. 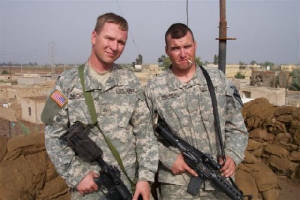 Left - Nike, Center - Nathan, Right - CPL Davd Butcher. 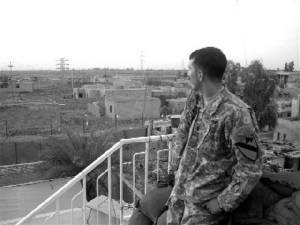 LT Ortega looking over the area from a roof top. Overlooking the area. 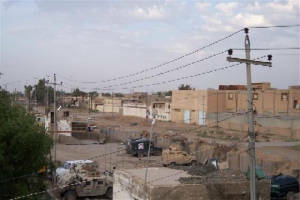 The street divides the town into two neighborhoods. On patrol with the tanks. 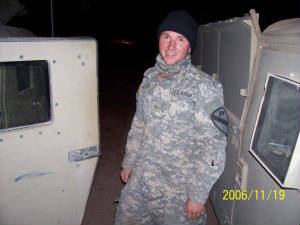 SPC MacVittie in cold weather garb. Nathan finds something to chuckle about.